My English blog has been very quiet for sometime. No posting. Have I given up blogging? No, that’s not true. I haven’t taken any time off. Actually, I’ve been very busy with Adda’s Bangla blog. Today I’ve published my 100th posting in Adda’s Bangla site within eight weeks. The reasons are very clear. It takes me very closed to my beloved Bangladesh and its wonderful readers. People come up with different ideas and views that they debate about. The most critical issues that highlighted in the Bangla blog are fundamentalism and Jamat’s collaboration with Pakistan in 1971. 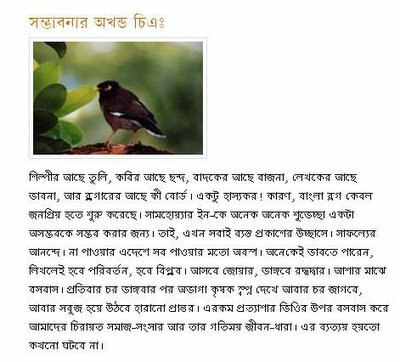 If you can read Bangla, please visit the Bangla blog site. On the top, I’m showing a snap shot of my one hundredth posting.